$850.00 41.5"L x 34"W x 15.5"D Box 1: 43 x 18 x 8"
Shown with 8 Group 31 batteries. Description: Our Best Value! Battery Enclosure with locking door and two shelves. MNBE-D holds 8 GVX3050T or 8 golf cart or 8 group 31 batteries. With the optional third shelf, the MNBE-D holds 12 group 31 batteries. 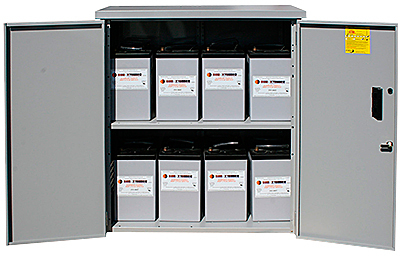 MNBE-D battery enclosure accepts MNEDC175 or 250 breakers. Gray powder coated steel. The image shows 8 GVX3050T batteries. Ships knocked down in two boxes. This large backup kit provides all the necessary breakers and brackets to assemble your own Power back up system. Battery Enclosure Key works with all MidNite Solar battery enclosures.